Quick reminder if you are heading out to Alive @ Five tonight: Due to fights between Stamford teens after last week's concert ended, SDSSD is trying out the tactic of emptying Columbus Park after the concert. 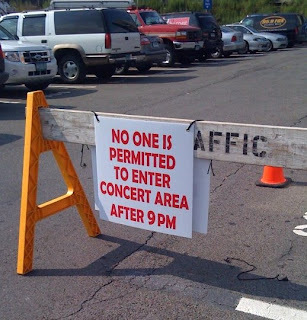 This sign says that no one can enter the concert area after 9pm. I don't remember if the concerts usually end by that time, but I guess if you're in the park already, the concert can continue until 9:30 or whenever. I'm not sure if the solution will work, but if you read comments from Advocate readers, you'll see that the situation got pretty scary. Thanks to the reader who sent me this photo from the show tonight! Cooney said several fights broke out after Thursday's concert as youths from the city's West and East sides confronted one other in Columbus Park... Police arrested seven people in Thursday's altercations, and three officers were injured, Cooney said. After discussions in the wake of last Thursday's Eve 6 concert, Stamford police officials and event organizers agreed to close Columbus Park from 9 to 11 p.m. after the show. Concertgoers, especially young music fans, said they were disappointed by the new policy... Jesse Arrico, 19, lamented the move because it would leave under-21 concertgoers with no place to go after the concerts. A greater police presence should be enough to correct the problem, he said... Police and concert organizers closed the park temporarily after last week's Eve 6 show. Many altercations between police and pedestrians occur after the music ends, usually at about 8:45 p.m., police and organizers said. "Most of the people who are the source of the trouble don't come for the concert," police spokesman Lt. Sean Cooney said. "They come after. We're trying to discourage that." Blog Stamford also has an interesting post up about the subject in which he proposes some other solutions. Click here to read my previous post about Alive at Five that links to my photos of the event. At least it didn't rain!!! Christopher Robin band should've been allowed to play longer or be the headliner. Those guys can jam! Wasnt very impressed with Southside Johnny.